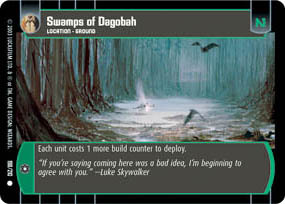 The bogwing was a flying reptavian native to Dagobah. It was very territorial and used its talons to pick up victims. It could carry up to nine times its own weight. 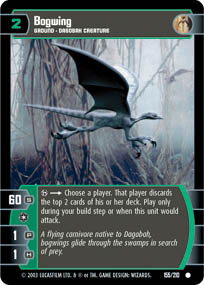 During the Cold War between the Galactic Republic and the reconstituted Sith Empire, bogwings were seen in the swamps of the ruins of Taris. Bogwings were released by Gungans to signal half-time at Gulliball games. There were two races of bogwings: the greater bogwing and the lesser bogwing. They both fed on small creatures dwelling the canopy, but the greater bogwing fed in the upper levels, while the lesser bogwing fed on the lower levels where it avoided larger predators such as the jubba bird. Star Wars: The Clone Wars – "Mercy Mission"
Star Wars: The Clone Wars – "Slaves of the Republic"
Star Wars: The Clone Wars – "Escape from Kadavo"